Adults collected May 22, 2005 mated in captivity and apparently laid eggs. 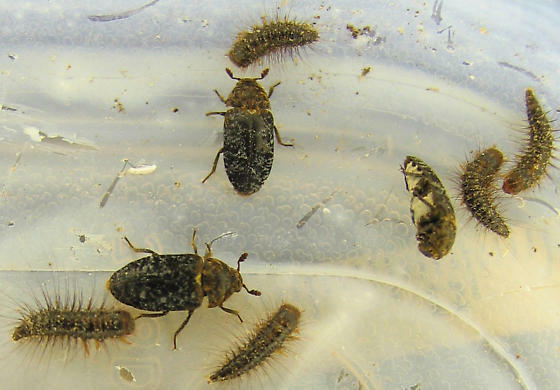 Although some of the adults have died, I now have about a dozen bristly and frisky larvae that started out eating dry dogfood, then with goldfish food added, but seem now to be primarily interested in the dead insects I place in their container. I stopped trying to maintain a moist environment for my captive D. talpinus a couple weeks ago, and they seem to be thriving sans water. I think I would like to get a D. lar*darius colony going also. This photo was located on bugguide.net by a graphics company making signage for a museum demonstration of Dermestid Beetles in action. They thought the image clearly showed what the little workers looked like. I sold it to them for a modest price.